The present look inside the church dates back to the renovations since the post war period, among which are the refurbishing done on the Retablo, the replacement of more massive and long wooden benches, the attachment of platforms for additional Santos on the columns and the repainting of the walls. 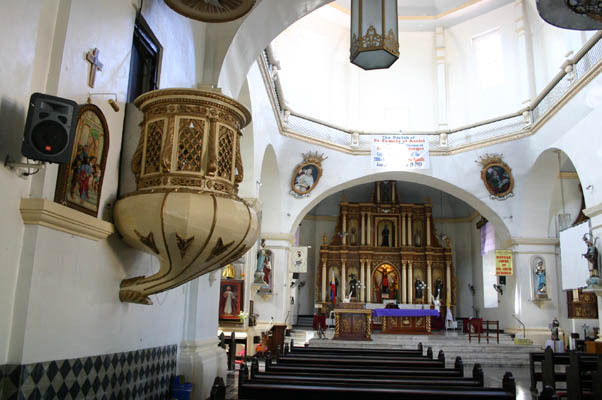 The hollowed out bottom center of the altar features the miraculous 18th century icon of Sariaya, the Santo Cristo de Burgos perpetually enshrined behind it. It is a replica of the holy medieval crucifix in Burgos, Spain accordingly petitioned from King Felipe V, and the subject of an every Friday pilgrimage to Sariaya by its fervent devotees from far and wide.